I have been pinning water walls for awhile but keeping put off making one with my kids because I don't have PVC pipe or plastic things to tie them with or masking tape or a fence I can use. 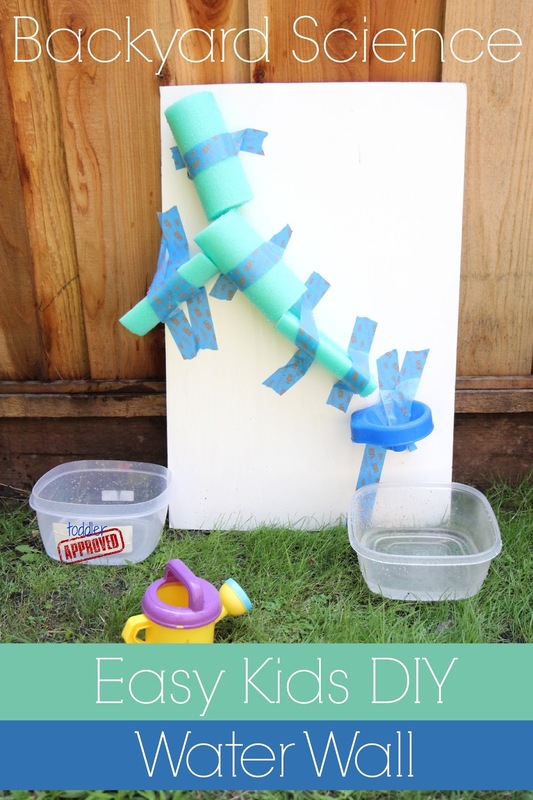 This week we decided to use what we did have around the house to make our own easy DIY water wall for kids. I kept it super simple. My five year old was the brains behind this operation and he told me what to do and what to cut and then I just helped with sticking things onto the foam board. Originally we were going to use our fence, but painters tape works the best on foam board, so we used that instead. When we started this activity we talked about gravity and how water travels from higher to lower places. My son used that information to move the pool noodle pieces around to make sure water would flow through them. We poured water through the top again and again to see how we needed to move the pool noodle pieces so that water would flow from the top to the bottom. My son wanted water ending up in both tupperwares, so it was fun to experiment and figure out how to do that. The kids had fun working together. They helped each other use the hose and fill up their cups. I loved listening to them brainstorm why water was going one way and not the other way and then come up with ways we could make our water wall better. In addition to playing with water and trying to get it to flow from the top to the bottom, we also attempted a Fizzy Water Wall activity using our three favorite materials- baking soda, vinegar, and food coloring! We poured baking soda into each of the dry tupperware containers. Then we mixed food coloring with vinegar in a little cup. Once the food coloring vinegar mixture was ready, my son poured it through the pool noodle water wall and it moved downward and landed in both tupperwares filled with the baking soda. The reaction with the vinegar and the baking soda was immediate and fun to watch. The colored vinegar dripped onto the baking soda and made colorful fizzy splashes. Some color also missed the noodles and just poured down the foam board. It was fun trying to predict where the water or vinegar was going to end up, how many drops in the baking sode, where the color was going to fizz, etc. The more colors you use, the more colorful your fizzy water wall will be. We love water and anything that fizzes... so these activities were cool. 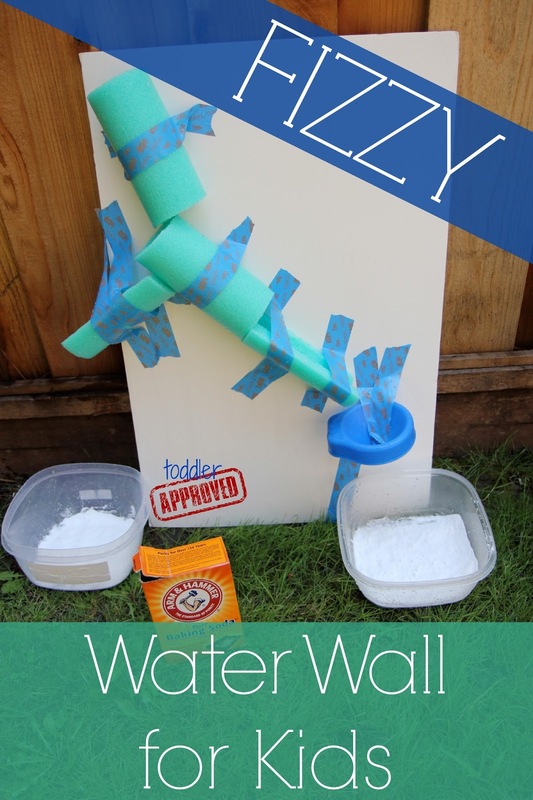 Have you made a water wall before? I am definitely going to try to do something like this!!!! I have been seeing water walls and all sorts like this all over blog land and pinterest and always, inside my head, I think, "OOOooo I'd love to make one of those" but I always chicken out! You have inspired me and made me think, maybe I could give it a go :-) Thank you! This looks like so much fun! We're going to have to try this. My 4-year-old will love it. Thanks for sharing! Brilliant idea and the children can do it themselves or with help...also can be changed around as not fixed. I thik this is the best one i ve seen, as you said no fancy equipment, cheap and child centred...£1 shop does noodles ans actually i have one in the garage!! !